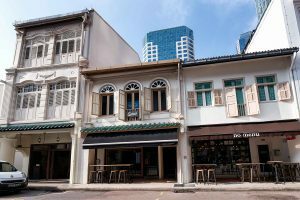 A 999-year leasehold District 1 shophouse at 21 Boon Tat Street in the Telok Ayer Conservation Area is being sold for $16.5 million. Reports say that Duck & Hippo group founder James Heng is paying $4,259 per square foot for the District 1 shophouse,which has an estimated built-up area of 3,874 sq ft. According to property agents, the psf price is a new high for a District 1 shophouse. The District 1 shophouse with attic occupies a land area of 1,759 sf and has a total area of approximately 3,874 sf. It has a tenure of 999-year leasehold w.e.f. 1 November 1884. Under the 2014 Master Plan, the site is zoned “Commercial” and is located within the Telok Ayer Conservation Area. Located along the bustling Boon Tat Street, the trophy conservation shophouse accommodates the highly-acclaimed Michelin Star restaurant, Cheek by Jowl. The Property has rare permanent F&B approvals granted for both floors. The shophouse has excellent specifications including amongst other, generous ceiling height, a regular, efficient and column-free layout. Having full length windows spanning the front of the shophouse coupled with the presence of an airwell, the District 1 shophouse benefits from good natural lighting. The CBD conservation shophouse is highly accessible and is within a short walk from Telok Ayer and Raffles Place MRT stations. Located within the CBD, the property is also easily accessible via major expressways including the Marina Coastal Expressway (MCE) and Central Expressway (CTE). Characterised by a myriad of F&B offerings and a dynamic entertainment scene, the Telok Ayer Conservation Area (comprising of Amoy Street, Boon Tat Street, Telok Ayer Street and Stanley Street etc) is one of the most frequented locations in the CBD. With its excellent location and access to a large surrounding catchment of working population, the area bustles with activities round the clock. The area is now home to two Michelin Star restaurants, with Cheek by Jowl being one of them. Mr Clemence Lee, Associate Director, Capital Markets, JLL, said when marketing the property: “Freehold conservation shophouse located in the CBD are highly sought after for their investment value and wealth preservation purpose and seldom made available for sale. Moreover, shophouses with F&B approval on two floors are rare as the authorities are becoming increasingly selective in granting such approvals. 21 Boon Tat Street presents investors a rare opportunity to own a well-located trophy asset with strong tenant covenant, superior 999-year tenure, rare permanent F&B approval and strong rental income. Astute investors would recognise the strong attributes of the property and seize the opportunity to add this trophy asset into their investment portfolio. We expect strong interest from investors such as boutique real estate fund, high-networth individuals, family offices and local companies. 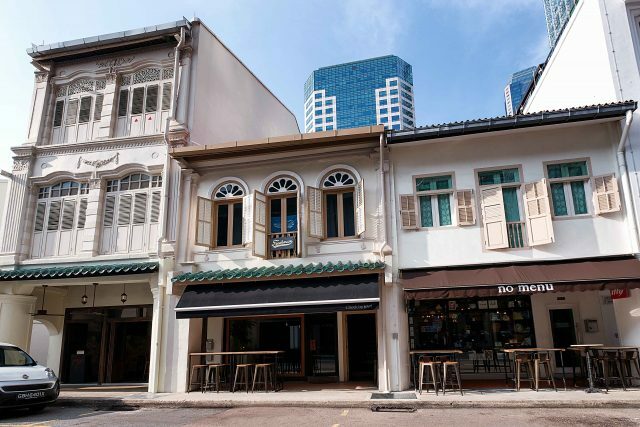 The latest transactions for shophouses in the Telok Ayer Conservation Area include 77 Amoy Street, which was reported transacted at $25 million ($3,500 psf approx.) in March 2018, and 75 Amoy Street, which was reported transacted at $18 million ($3,900 psf approx.) in February 2018. The indicative guide price for the District 1 shophouse was set in the region of $17 million reflecting around $4,388 psf on GFA. It was closed at a slightly lower price. Paul Ho, the chief mortgage consultant at iCompareLoan said: “Properties such as the District 1 shophouse may be bought under personal name, but total debt servicing Total Debt Servicing Ratio (TDSR) will apply on the individual’s income on such purchases. To buy a commercial or industrial property under company name, total debt servicing ratio TDSR also applies on the individual director’s income if the company is an investment holding company or an operating company that is loss-making or does not have sufficient cash flow to servicing the repayment. Are planning to purchase a similar District 1 shophouse but unsure of funding? Don’t worry because iCompareLoan mortgage brokers can set you up on a path that can get you a commercial loan in a quick and seamless manner. Next articleIs HDB Lease Buyback Really Worth Pursuing?